Here at Auf Wiedersehen Windows we use 'A' rated Double glazed units as standard using soft coat glass technology and warm edge spacer bar with Argon gas fill cavity in your double glazing, this greatly reduces your heat loss which will cut down on your heating cost by up to 35%. We also manufacture a broad range of double and triple glazed decorative glass products and replace your misted up double glazed units with our new 'A' rated double glazing also a full repair service for broken locks and handles is available, along with our 'A' rated double glazed windows, doors, conservatories and sunrooms. To discuss your requirements for decorative glass panels, double glazing, upvc conservatories, doors and windows or any of our other products get in touch on 028 9060 2040 or email Auf-Wiedersehen Window Systems. Alternatively you can Chat to us on Messenger. As one of the leading Belfast UPVC window and double glazing suppliers we use the highest quality frames currently available on the market today. Auf-Wiedersehen windows will professionally install your window system with the minimal disruption and inconvenience. If you are looking for that individual touch we can design and install bespoke decorative glass. For further details on our upvc windows as well as bow, bay window, canopies please look at our windows page. uPVC door suppliers to the trade and the public in Belfast and across Northern Ireland. Our doors are available in traditional and modern styles across a full suite of colours with energy efficiency and security our top priority. We are confident our extensive selection of doors will suit your property and taste. Please view our uPVC & Composite Doors page to view our extensive range. For the ultimate indulgence have Auf-Wiedersehen install a bespoke UPVC Conservatory to your property, custom designed to your needs. 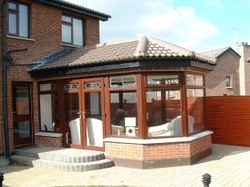 Please view our uPVC Conservatories page for further images and information.